There are two dishwashers available, one in the kitchen downstairs and the second one is in the kitchenette on the ground floor. There are two toasters: one in the kitchen and the second one is in the kitchenette. Beautiful, homely and very comfortable house in great location. We booked the Old Monmouth over New Year, for the week of 28th Dec to 4th Jan. Everyone who stayed was really impressed with the place. Spacious bedrooms (all with ensuite bathrooms! ), amazing kitchen / entertaining space, and very homely living areas which were great for games in the evening. It looks nice in pictures, but it's genuinely even nicer in person. Will definitely book it again if we decide to revisit Lyme Regis. Lyme Regis itself is lovely - interesting shops, cafes and some great pubs. Also a lovely beach. The surrounding areas are also beautiful if you like to go for day trips, walks etc. Exquisite house in the center of the town. We booked the entire property for a family Christmas (12 adults) and couldn’t have wished for a better property. The decor, furnishings and atmosphere is one of luxury and warmth. We felt immediately at home and everything we needed was to hand. The basement kitchen with huge breakfast table and butchers block became our gathering point whilst the sumptuous lounge and cosy snug were used to play games drink wine and listen to music. The hosts went over and above with A 10ft xmas tree, decorations, wine and mince pies - all unexpected but most appreciated. Lyme Regis was a 5 minute stroll away and is idyllic. We will be back! You won't be disappointed if you book this amazing property. There are so many plus points and here are a few of them. 1) It is so large and spacious that you can all sit together very comfortably as a big group or go and have a quiet moment in one of many lovely rooms. There was so much room for the children to play. They were spoilt for choice as to which room to play in. 2) All but one of the bedrooms has an en-suite which is an amazing luxury. The room without an ensuite has it's own family bathroom nearby anyway. 3) It's beautifully decorated and due to the age of the building each of the rooms has its own character. 4) It's right in the heart of Lyme Regis with everything on your doorstep. Lyme Regis is such a beautiful place with lots of interesting things to do that you don't need to venture further afield. We used the car just once during our visit. 5) Tony and Alex were great at promptly answering any questions we had prior to our arrival. They were there when we checked in which was helpful. We were a little concerned about the parking prior to our visit but we need not have worried as parking in the nearby car park was easy. It's definitely a place we would all love to come and stay in again in the future. Thank you Tony and Alex. 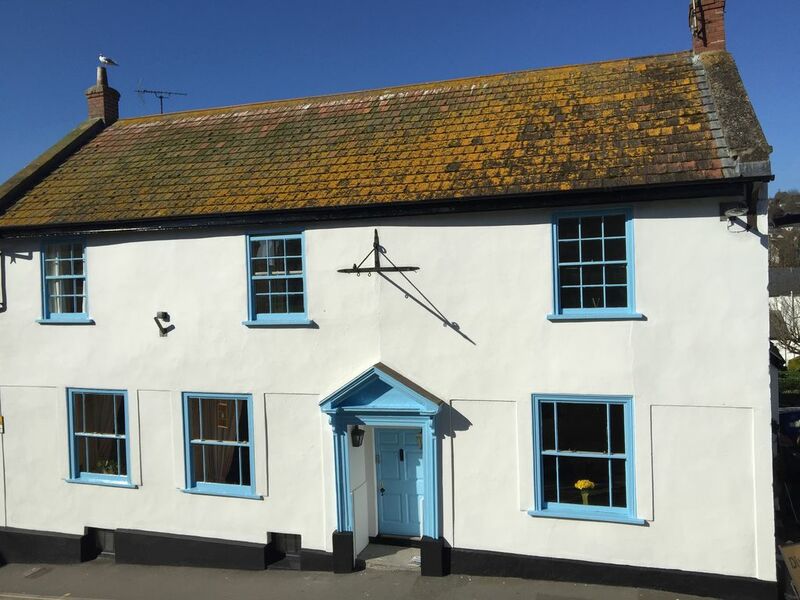 Beautiful, historic property in an amazing, central Lyme Regis location! We spent a fantastic week at The Old Monmouth in Lyme Regis. We were a large family group of 12 with 7 adults, 4 kids (aged 7 to 11) and a 1-year old. It's an historical property so there are stairs and some fairly narrow staircases but it's in beautiful condition and very well equipped. In the mornings and evenings we lived in the kitchen and dining areas on the lower ground floor and sat the entire group around the dining table comfortably (several passionate Pictionary 'wars' were waged late in to the evening!). All of the bedrooms were very comfortable - very high quality bed and linens and the ensuite showers/baths were excellent. The Old Monmouth is in an incredibly central location and dozens of restaurants and pubs are within a short stroll. The beach is also only a few minutes' walk away. Overall, we had a fantastic week and I would highly recommend it to others. We had a wonderful holiday at the old Monmouth - did not need to use the car for the week, walked around Lyme Regis, exploring good places to eat, swimming in the sea, and finding fossils. The house was extremely well equipped and very beautiful. Everyone had their own shower room or bathroom, which was lovely. Thank you Tony and Alex, we hope to be back very soon! A lovely, comfortable home close to the beach and the town. Four generations enjoyed a great family break in this charming property. Access to kitchen and dining room is via a narrow staircase with rope handrail which was a bit tricky for some of us to navigate. That said, Tony and Alex were brilliant, thoughtful hosts. Fresh flowers and wine very much appreciated. Thank you both.